It is not so unusual that a 14-year old teenager in Lucknow, India might teach herself to use a computer. But when Promila Bahadur accomplished this in 1991, what she did with this knowledge has profoundly changed the lives of many young women in a poor, rural village just 15 kilometers from her home. When Promila would visit the nearby village of Nizam Pur, located in Chinhat Block, Lucknow District in Uttar Pradesh, she always felt uncomfortable that village residents, and especially young girls, had no opportunities to gain an education. In this village, and thousands like it throughout India, young women were expected to learn to cook and take care of a home, get married, and then raise a family. But this ongoing cycle of poverty and illiteracy has perpetuated a largely unfulfilled population in rural India. So, without concern for what other people might think, and with the blessings of her parents, she started visiting the village with a computer, and began teaching computer literacy to young women. Her students’ parents approved of her helping their children. Promila was self-motivated to help strengthen Indian society by empowering girls to become the mothers of a literate society. Using her own money, she started the Guru Computer Education Center (2004), later renamed the Guru Institute of Information Technology, bought more computers, rented an office for $70 per month, and eventually hired local staff. The initial class included seven girls, and later she included boys and some older women, taking on more than 60 students at a time. 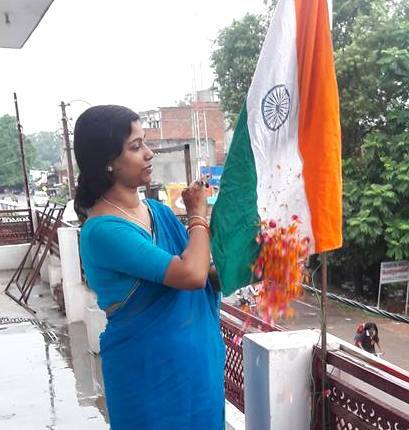 Hoisting the Indian flag at the Guru Institute of Information Technology. To date, Promila has trained over 2000 individuals, including youth, women, elderly and children! In 2004, the government of Uttar Pradesh recognized and approved Promila as the first Village Level Entrepreneur (VLE) to start a Common Service Center (CSC) for improving the day-to-day needs of rural Indians. Even people in neighboring villages started depending on her CSC for various services. They were not computer literate, so she began imparting computer education to the people of her chosen village and the neighboring villages. Last year, at a National Conference of CSCs hosted by the Government of India, Promila was selected as one of only six out of 500 VLEs in all of India to receive a special banner! Honorable IT Minister Shri Ravi Shankar ji acknowledged the institutional services made to society through Promila’s Common Service Center. Uzma Irfaan’s student receiving award from Promila. Uzma is the Instructor in the back. Promila’s life has changed in many ways since starting her Institute: She has completed her MCA, and MTech degrees in Computer Science, has gotten married, and obtained her Ph.D. in Computer Science from Uttrakhand Technical University in India. Her scholarly work is on multidisciplinary research in Natural Language Processing, which involves incorporation of English, Sanskrit and computer languages. She has also given birth to two beautiful children! 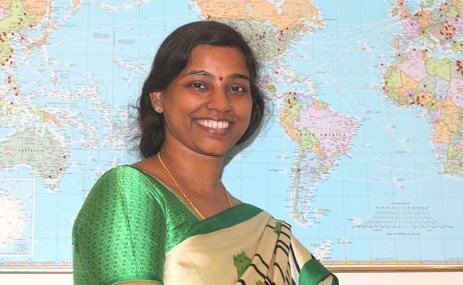 In 2015, she and her children moved to Maharishi University of Management in Fairfield, Iowa, USA, where she is currently Assistant Professor of Computer Science. 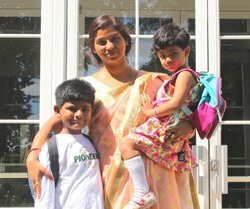 Promila with her 6-year old son and 3-year old daughter outside the Maharishi School. Promila decided to come to MUM for a number of reasons: (1) She liked the idea that the University teaches on the block system, providing students the opportunity to study and go deeply into each course, full-time, for a month. (2) Because of MUM faculty interest in Sanskrit, this presented good opportunities for research collaborations. 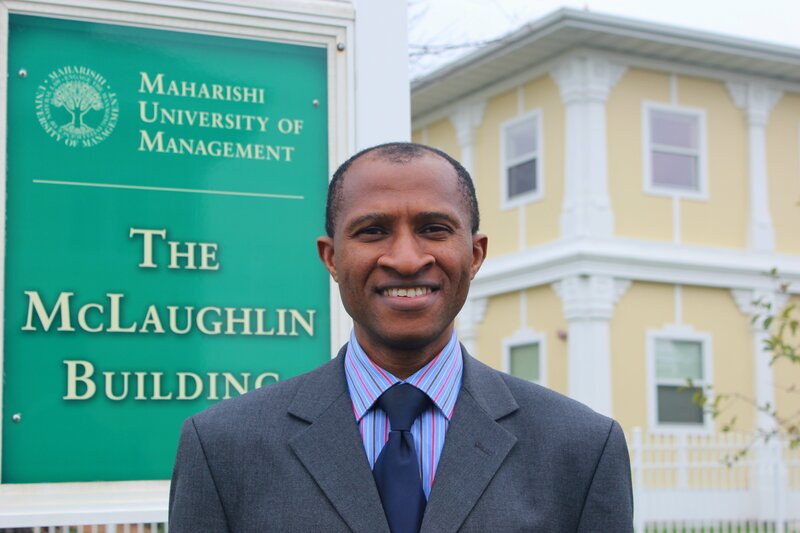 (3) Adjacent to the MUM campus is the Maharishi School of the Age of Enlightenment (MSAE), an award-winning school where her children could experience the best of American education. In addition to all these important responsibilities, Promila maintains daily contact with the manager of her Education Center in India. She is proud of her ability to multi-task, and feels that her daily practice of the Transcendental Meditation® technique helps her maintain a balanced, increasingly successful life. Because her Institute and its growth are the great passion of her life, Promila continues to financially support it, happily giving 30-40% of her salary at MUM to support the Institute and its current staff of seven near Lucknow. 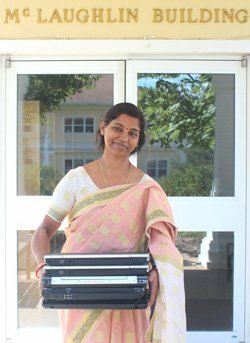 Before Promila returned to visit India with her children this past June, she heard that our local school (MSAE) had 6 used computers for sale. So, she bought them (again with her own funds), and carried them back to India for the village and Education Center. Promila purchased computers from MSAE here in Fairfield, and hand carried them back to India for her CSC this summer. Promila’s plan is to establish one computer education hub among a cluster of six Indian villages. This hub will also cater to their general day-to-day needs apart from imparting computer education: like providing them medicines, banking facility, ATM, general insurance, etc. This hub might also make farmers more informed about new technologies and ways of organic farming. Farmers could be informed how, where, and at what price they should sell their produce. People should own and live in simple, modern homes, and make a decent salary, and there should be good schools and other modern facilities for all the people.